NYU School of Medicine announced Thursday it will provide all current and future students full-tuition scholarships to attend medical school. The institution, which broke the news to incoming students and their families during the White Coat Ceremony, is the first major medical school in the U.S. to provide free education to all students regardless of financial merit. NYU leaders called the decision a "moral imperative" considering the impact medical school debt has on physician stress levels, diversity in the profession and the provider shortage. 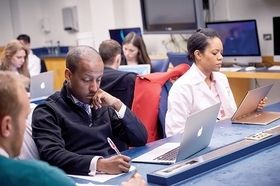 "This gives our students choice in two ways: First it will enable students who couldn't afford medical school to afford it and the second thing it does is enable students enrolled in medical school to think with a clear eye (about their future specialty)," said Dr. Robert Grossman, the dean of NYU School of Medicine and CEO of NYU Langone Health. NYU leaders also hope the fund will enable the school to attract more diverse candidates who won't be deterred from pursuing a career in medicine because of debt. Medical schools across the country have made efforts to alleviate the burden of medical school debt but NYU is the first major institution to eliminate the burden entirely for all its students. Doctors graduate with crippling medical school debt and it sometimes causes them to seek higher paying specialties instead of lower paying ones that face shortages, like primary care or pediatrics. Additionally, the debt can turn off aspiring high school and college students from pursuing the field due to financial constraints. On average, students who graduate from public medical schools are left with about $181,000 in debt, according to the Association of American Medical Colleges. The debt is even higher for students who attend private schools. Research shows this high debt can add significantly to student and physician stress, making them feel cynical or depressed. It has even been shown to contribute to suicidal thoughts. All of these issues can impact patient care. "Ultimately, this is about patients and creating a fantastic workforce that patients deserve," said Dr. Rafael Rivera, associate dean for admission and financial aid. NYU predicts it will need $600 million to sustain the program long term. It has raised about $450 million through endowments so far. The school has been raising funds for this over the last 11 years under the leadership of Grossman. "This wasn't a decision we made yesterday. We thought about this and pursued this idea for the past 11 years. We do think it's a moral imperative. The burden of debt, that is very difficult to get your head above, frankly, and that colors decisions in terms of career choice," Grossman said. Rivera said he's confident the school will get the remaining $150 million needed for the fund soon. NYU raised $240 million in just the last nine months. It's endowment fund is about $2.7 billion overall, he said. Medical school tuition at NYU this year is $55,018. The tuition goes up about 2 to 3% every year depending on operating costs but the scholarship will be able to cover the rise in tuition each year, Rivera said. The fund will only cover tuition, so students are still responsible for room and boarding costs, and health insurance. NYU currently has 442 medical students and each incoming class has about 100 students. Medical schools have tackled medical school debt in other ways. For instance, some schools, including NYU School of Medicine, offer programs for students to graduate in three years instead of the traditional four. Sometimes the option is only available to those interested in primary care to try to boost the workforce. Rivera said he hopes other schools consider establishing a tuition-free fund for medical students. But the medical school community isn't sure if it'll start a trend. The financial support and commitment it takes for a school to provide such a broad incentive to students isn't realistic for all schools, said Julie Fresne, director of student financial services at the Association of American Medical Colleges. "I think a lot of schools would love to be able to do this, but it's more difficult for some schools. It takes a tremendous effort to pull something like this off and it's pretty impressive," she said. Fresne also emphasized that although medical school is expensive, the federal government offers financial loans to cover the full cost of tuition and repayment plans take into consideration income. "Medical school is still a great investment," she said.